Today I fly to Guatemala, plane departing in less than an hour. Thumb-scribbling this note at a bustling gate at Atlanta's International Terminal, I have one theme on my mind: friends. I am going to meet Jesse, with whom I shared two work trips in 2012. He opened a socially-conscious, locally and sustainably sourced taco shop in the central square of Quetzaltenango (Xela, pr: shay-luh ). We join forces for seven days to create a non-diminishing cache of media to be used to market and promote the business for years to come. I am encumbered with the most camera gear that I've ever carried domestically, or internationally. Backing up 24 hours, I spent the night at Noah's home in Virginia Heights, a community in Atlanta. Noah and Jesse and I all worked together for Pencils of Promise while in Guate those years ago. Noah and his fiancée Ioulia and I shared the home-office in Matagalpa, Nicaragua March-April 2012. A friend I've seen a small handful of times since then, it took no time to catch up like days of yore. Most notably, Noah enacted one of the more prized tenets of friendship I've felt, by indulging a curiosity yesterday. I offhandedly remarked it is a continual goal of mine to learn to drive stick-shift. Without pause, he offered to take me to a lot and let me get behind the wheel. No baulk or hesitation at the potential pitfall of putting my amateurish manual transmission knowledge to the test. There was something special to this casual offer. I am trying to process it further but will leave it open ended to ponder for you. Not 24 hours before that, Amanda and I spent a brief, serendipitous couple of hours at Jessie's new home in Atlanta. Although JLo and I have known each other as friends for 13 years, it was her boss Lindsey's remark at the housewarming barbecue that reminded us to "know your squad." Being in Atlanta for a weekend and happening into her housewarming and catching up to a cheerful, lovely friend and her instantly wonderful companions made 2003 rush back to me. And finally, I must comment on the folks I call friends in Charleston, SC. I spent a week photographing outside of town, but spent every night with some people I regard as nearest and dearest companions in this world. Whether it is Elizabeth, whom I met in Laos four years ago and never looked back; or her boyfriend Ben, who opened his home to me, is one of the smartest and more interesting builders and photographers met, yet; Chris and Alex are wildly talented illustrator/painter couple who opened their home and studio and world of exciting friends and couldn't be any more humble or nice people in the world; then Joshua and Amanda, who make everything in life 100x more interesting and fun and a life worth living; and finally Luke, whom I've known for my entire life, is my "God-brother" to laughably invoke some meaningless religious language for our relationship, and is like family and game for most anything I threw his way. This trip is to celebrate the great work of a friend, compounded by the week of exhausting and exhilarating friendships, further propelled and elevated into newer experiences, yet. Nearly five years ago, before flying to Guatemala on a whim with a nonprofit and people I knew nothing about, I sent out an email to spawn the coming years of staying in touch and keeping abreast my friends and family with travels, work, thoughts, and surprise musings. If you wish to join that same list of people, I urge you to sign up through this website to receive emails full of pictures, video, walls of text like this, and the like. Thanks, please reach out with any thoughts or questions or new business, and see you next from Guatemala. 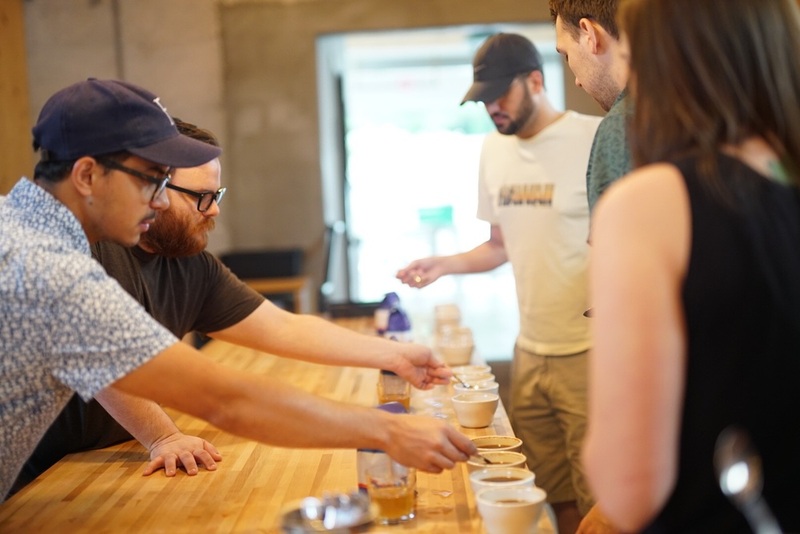 Diego (who, coincidentally is Guatemalan) guiding the coffee cupping at Charleston's branch of Counter Culture Coffee; Chris Nickels over the shoulder in green in a nice new birthday shirt. Joshua, Amanda, Elizabeth, Ben, and Luke. My kings and queens of Charleston, SC. Alex Waggoner at home in her studio. Ann Ladson Stafford, at home with her chickens. A new friend from Haystack Mountain School of Craft who makes a bangin' roasted tomatillo salsa and Daisy Cutter cocktail (cf: FIG, in Charleston). Oh yeah, not to mention a talented metalsmith. Find more current and probably up-to-date images by following on Instagram: @chris___battaglia (yes, that is three underscores because there is a male model from New Jersey, and others).